The first condition for the selection of dust collector and baghouse filter bags is the cleaning method of bag filter. It can first decide whether the filter material for dust collector filter bags is weaving, needle felt or compression felt. As for the specific standard of dust bag, we can make further thinking based on other filtering conditions. The characteristics of this cleaning method are that the kinetic energy applied to the dust layer is smaller than that of the pulse jet blowing type and the air reversed blowing type, and it is the low energy type dust cleaning. Therefore, it is suitable for using the woven fabric dust collector filter bag. The oscillating wave of the rich and soft woven fabric is better. This dust removal method usually uses fabric dusting cloth filter bags, but it can also use felt with light weight, softness and small rescaling scale. 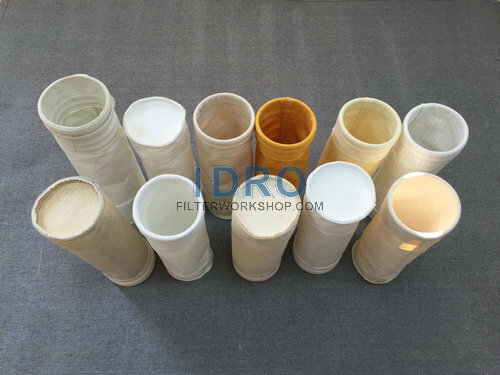 In the meantime, the largest number of fiberglass filter bags is used, and most of them were used in large bag filters. This dust removal method applied to the dust layer is the highest kinetic energy of ash removal, and it is a typical method for external filter ash removal. The fine dust power is very strong, and the residual dust inside the duster cloth yarn is less. The baghouse filter bag is usually made of felt or needle felt. Under the effect of pulse injection, the dust removal filter bag will become very large at a time and cause great stress. Therefore, it is necessary to use the filter materials with large tensile strength. The dust collector filter bag is often in conflict with the filter bag cage, so we must use dust removal filter bags with good wear resistance. The cleaning of this method requires that the dust collector and baghouse filter bag be with excellent rigidity, small pore and good wear resistance, so that when the air blowing ring is moving over and down, the dust filter bag is constant and will not be hair. So we can only use felt or needle felt, and thick, high density felt is required. The kinetic energy applied to the dust is at the center of the high energy and is low kinetic energy type. This kind of dust removal requests that the filter material of the dust collector filter bag be softer and be with certain rigidity. When the fabric dust collector filter bag is used, the satin and twill filter fabric are suitable. But considering the power of dust removal, the speed of filtration and the wear resistance of the skeleton, the best choice is the needling felt, weight 300 to 600g/m2 is suitable for needle punched felt, textile weaving is rarely used, and various surface treatments should be made if necessary. The ash removal kinetic energy applied to the dust layer is low energy. In the early days, the majority of the fabric baghouse filter bags were used. Now, most of the needle punched felt filter bags is used. The primary factor is to improve the filtration speed. The weight of the needled felt cloth is 280/ to 350g/, with a thickness of 1.0mm to 1.3mm, and with better permeability.